Thanks to Dr. Juan Jose Segura Fonseca, Laboratorio de Patolog�a y Citolog�a, S.A., San Jos�, Costa Rica, for contributing this case and the discussion. �To contribute a Case of the Week, follow the guidelines on our Case of the Week page. Visit the Covance booth #112 at the USCAP meeting to learn how ACUITYAdvanced biotin-free polymer detection can deliver the consistent high impact results your lab needs. ACUITYAdvanced offers crisp, clean, enhanced staining with shorter incubation times than the standard ACUITY kit. ACUITYAdvanced Polymer detection�s high sensitivity also uses less antibody, allowing your lab to save time and money as a result of reduced antibody usage and shorter turn around times. ACUITYAdvanced is available in two distinct formats: ACUITYAdvanced for human tissue and ACUITYAdvanced Mouse-on-Mouse for mouse tissue. For more information please visit www.covance.com or call 1.800.223.0796. 1. We are currently updating the Bladder and Breast-nonmalignant chapters. 2. Visit us at USCAP, Booth #1303. 3. Did you know that you can support a good cause just by surfing the Internet? PathologyOutlines sponsors The Detroit College Promise, a non-profit which next year will offer scholarships to all 6000 Detroit Public School seniors. You can support this program by using www.GoodSearch.com as your search engine. When you visit this website, select the Detroit College Promise as the charity that will receive $0.01 per search. Click on http://www.goodsearch.com/toolbar/the-detroit-college-promise to download the Goodsearch toolbar, which makes these searches even easier.� Goodsearch is a Yahoo based search engine, and our office uses it daily. Use the Goodshop button on the toolbar for online purchases, and the seller will donate a percentage of the sales price to our scholarship program. A 39 year old man presented at an outpatient clinic with a large tumor that had been growing in his left buttock for 6 months.� He was clinically diagnosed with a probable subcutaneous dermal cyst. He had a history of penicillin injections 30 years before, due to several episodes of purulent amygdalitis (tonsillitis). Surgery revealed a large saccular cystic-like lesion in the subcutaneous tissue. On section, it contained an oily substance with a yellow color. Grossly it was surrounded by fat (Fig. 1). 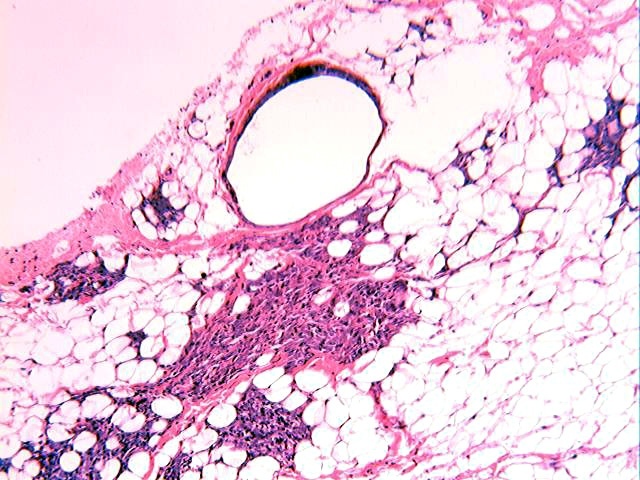 Histologically, the wall of the cyst was made of fibrous tissue (Fig. 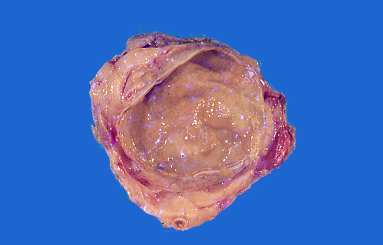 2), accompanied by a lipogranulomatous reaction (Figs. 3, 4). 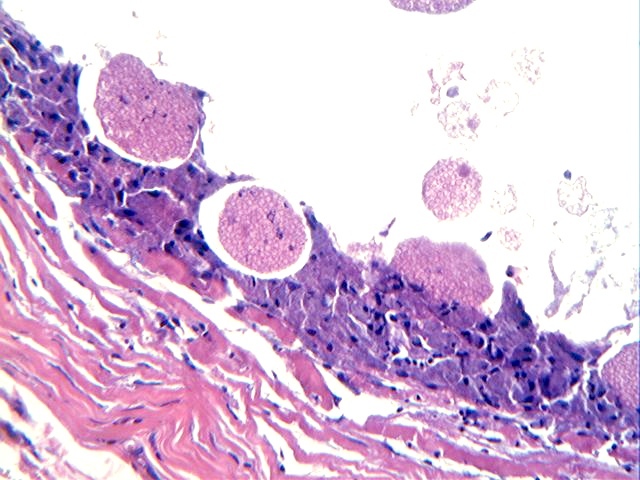 Many eosinophilic spherules containing red blood cells were observed within histiocytes lining the cyst wall (Fig. 5).� Some larger spherules looked like a bag of marbles (Fig. 7). Myospherulosis was first described in 1969 by McClatchie and associates. They reported 7 patients from Kenya with unusual soft tissue nodules in the arm, legs and subcutaneous tissue of the buttock (E Afr Med J 1969;46:625). 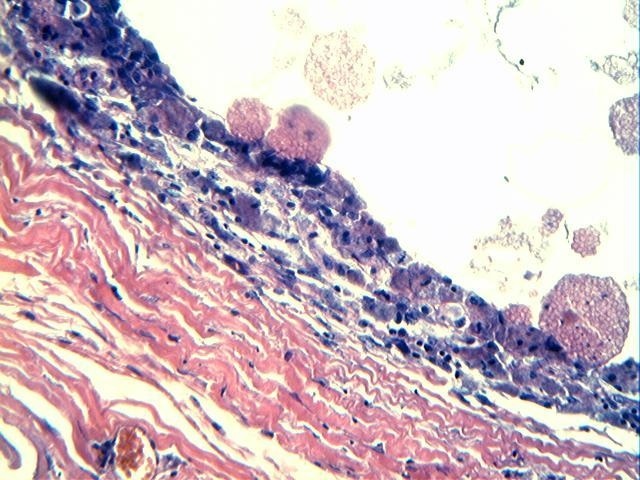 Due to the involvement of skeletal muscle in some of their patients, they named this entity myospherulosis (Am J Clin Pathol 1969;51:699). �Five patients were subsequently reported by Hutt et al in 1971 in Uganda, who renamed the entity subcutaneous spherulocystic disease (Trans R Soc Trop Med Hyg 1971;65:182). 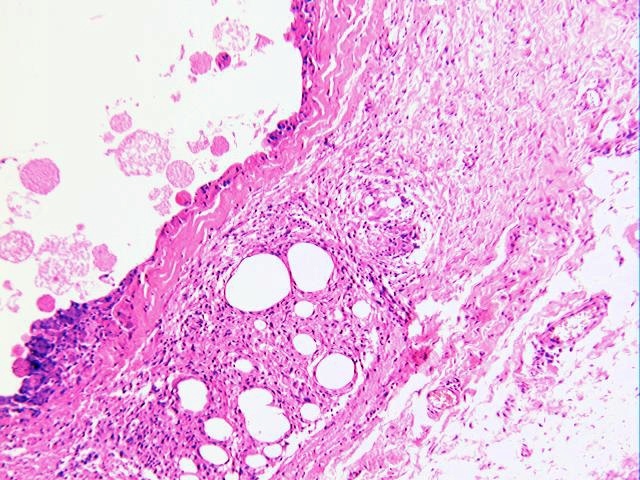 The dermal nodules were cystic cavities with a fibrous wall lined by histiocytes and multinucleated foreign-body giant cells, with lipogranulomatous inflammation in the adipose tissue adjacent to the cavities. �Spherical fungus-like structures were seen adherent to the fibrous wall, loose and within histiocytes. �The structures were formed by a sac containing smaller eosinophilic spherules, and were referred to as a �bag of marbles�. �Initially these structures were thought to be some kind of fungus, but the usual stains for fungi were negative. In 1977, Kyriakos (Am J Clin Pathol 1977;67:118) reported for the first time cases outside of Africa. �He described 16 cases that, unlike the African cases, were located in the paranasal sinuses, nasal cavity and middle ear. �He noticed that most of the patients had undergone surgery and that the surgical wound was packed with gauze impregnated with petrolatum and tetracycline ointment, which suggested an iatrogenic etiology. This was demonstrated by De Schriver and Kyriakos, who induced similar lesions in experimental animals (Am J Pathol 1977;87:33). 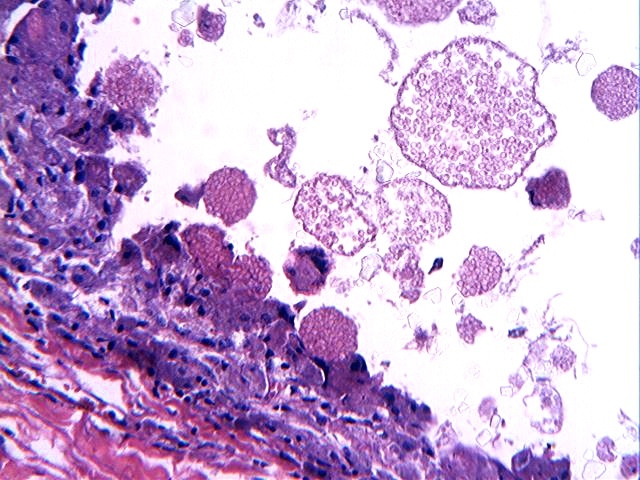 The pathogenesis of the disease was confirmed by Rosai (Am J Clin Pathol 1978;69:475), and later by Wheeler et al (Arch Otolaryngol 1980;106:272). �They demonstrated that the spherules were erythrocytes damaged by endogenous and exogenous fat. The disease was reproduced by incubating human red blood cells with tetracycline ointment, lanolin, petrolatum and liquefied human fat. Travis (Arch Pathol Lab Med 1986;110:763) and Shimada (Am J Surg Pathol 1988;12:427) confirmed the presence of damaged erythrocytes by immunostaining for hemoglobin. �Kakizaki (Am J Clin Pathol 1993;99:249) demonstrated that the wall of the spherules was due to the physical emulsion phenomenon that occurs between lipid-containing materials and blood. The damaged erythrocytes are then enclosed by a lipid membrane and later phagocytosed by histiocytes as part of the lipogranulomatous reaction that takes place in the adipose tissue. Cases have been described in relation to the endogenous membranocystic degeneration of fat that occurs in lupus erythematosus and in membranous lipodystrophy with dermal atrophy due to local application of steroid ointment (Arch Dermatol 1991;127:88). 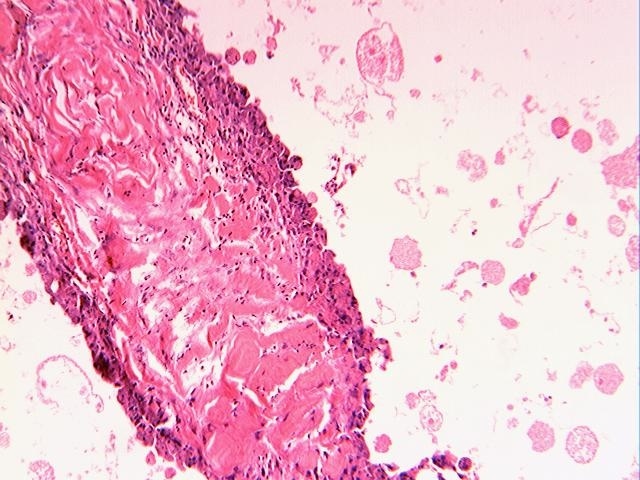 Synchronous occurrence of myospherulosis with aspergillosis of the maxillary sinus has been reported (Oral Sur Oral Med Oral Pathol 1987;63:582, Arch Pathol Lab Med 2005;129:e84). �In the gluteal region, this entity is described in relation to old injections of petrolatum based hormones and penicillin (Diagn Cytopathol 1988;4:137, J Am Acad Dermatol 1989;21:400).